For Paula Lauren, Oakland University Computer Science and Informatics Ph.D. student, work time is often solitary and intense. But when she recently attended Windsor—Detroit Hacking Health — a hackathon programming competition focused on the healthcare industry, and the first one to be hosted “cross-border,” five minutes from Windsor in Techtown Detroit — she said she enjoyed working together in a team and creating something that can help others. 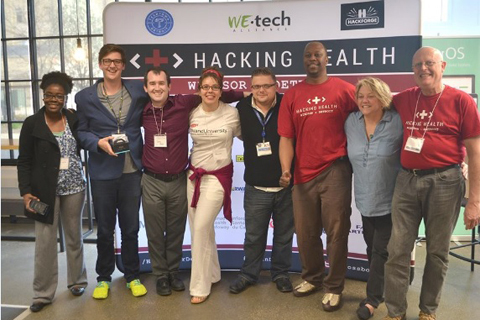 “The whole (hackathon) experience was very intense and exciting,” Lauren said. The projects had to be something to improve the healthcare system, “by inviting technology creators and healthcare professionals to collaborate on realistic, human-centric solutions to front-line problems,” according to the Hacking Health website. Students pitched their ideas, and teams were formed at the beginning of the weekend. After getting together, the teams had under 48 hours to work together to develop their application to get it ready for judging. Lauren’s group’s application, CarePRN, which she said “leverages the Uber model for caregivers in home healthcare,” bringing caregivers and careseekers together for providing instantaneous and scheduled care as needed. According to Lauren, the app has potential for regular use, and with the constant growth in Mobile Health there’s a lot of data that’s going to be generated especially with the proliferation of home healthcare sensors that’s making it safer for elders to stay at home. “The knowledge that I’ve acquired in the OU computer science and informatics program has certainly provided me with an excellent foundation in predictive analytics for handling the deluge of sensor data,” Lauren said. Her group received the “Best Student Team from the U.S.” and the “People’s Choice Award” for the app. While in-class learning is important, Lauren said hackathons are an enjoyable and fulfilling experience, because they provide a unique, real-world perspective in application development. “Hackathons require you to get comfortable with discomfort very quickly,” Lauren said.